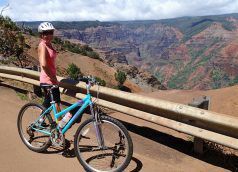 One of the most beautiful places on the island of Kauai, which I have called home for nearly two years, is Waimea Canyon. Nicknamed as the Grand Canyon of the Pacific, it is spectacular with similar hues to its earth tones as the Grand Canyon, but it does stand out. The Grand Canyon doesn’t have.